Whatever happened to all those huge pipes that were loaded into a container in March? They arrived in Ekwendeni in July where they were stored until John arrived at the end of the month when they were loaded (manually) onto lorries and taken to Zenda – not a place that is well known in northern Malawi as it is a small village miles from anywhere. Yet the road over a stream to the school is impassable in the wet season. Hence no children go to school for 3 months of the year. 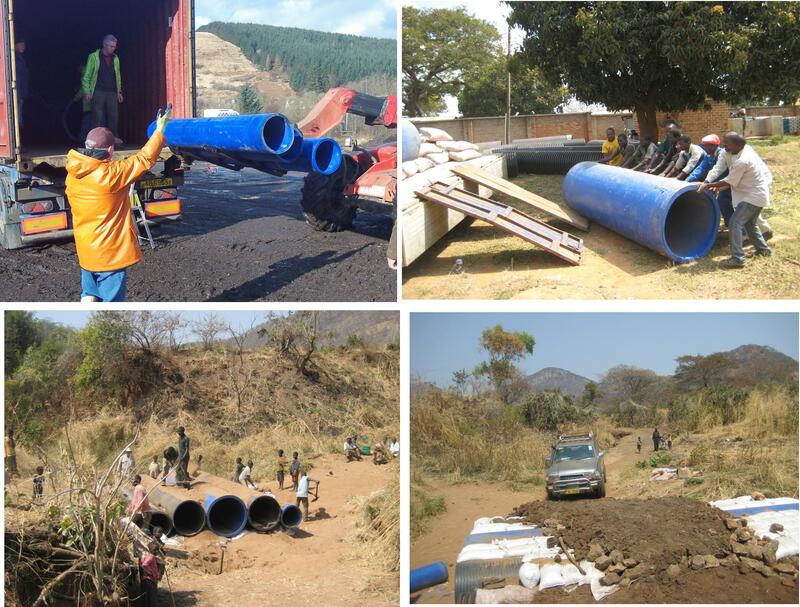 John is using the pipes in conjunction with bags of sand/cement mix and special membranes and with the help of the local people to build a culvert which will allow all-year-round access to Zenda. As you can see from the pictures, the bridge is not yet finished but Ben, driving the Raven Trust vehicle, tested its strength. Finishing of the bridge has been hampered by unseasonable heavy rain but, by the time John comes home at the end of the month, it will be all finished and the people of Zenda will look forward to their first rainy season when they will not be cut off from local services. Another bridge will be built at Henga to replace the present “bridge” across a deep gully. This kind of work makes a tremendous difference to the lives of people in remote communities. Next PostNext Dundee Depot – at last! Please note change of Monday opening!